Do You Bento? 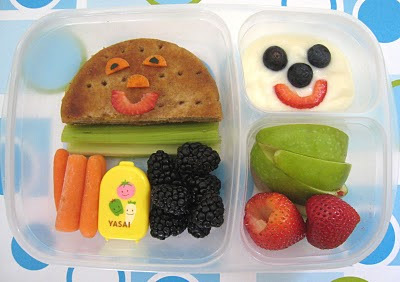 Great School Lunch Ideas! 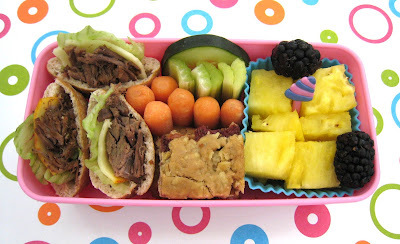 Way back in June, I sent out the call for some guest bloggers and Shannon over at What's For Lunch in Our House sent me these AMAZING ideas for bento lunches. They look like they are just as much fun to make as they are to eat! If my teenager didn't snarf down enough food to feed a small village, I could totally get into making these! Prep time is on & above normal lunch preparation. Simple Bento 2 - Leftover roast beef, muenster cheese & lettuce in mini pitas, carrot/celery/cucumber, strawberry oatmeal bar, pineapple & blackberries. Packed in a Hello Kitty box with a decorative pick in the fruit. No extra prep. 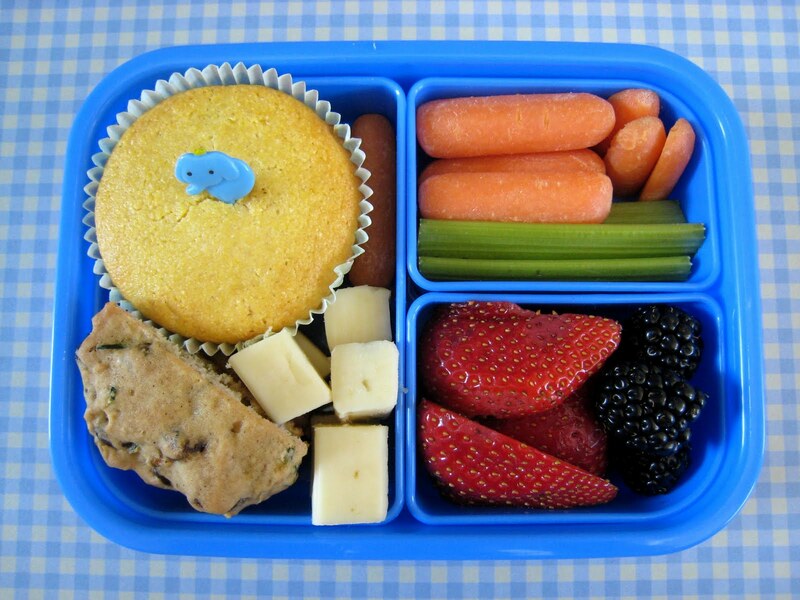 Simple Bento 3 - Stuffed muffin (corn muffin with chicken & veggies inside) decorated with an elephant pick, zucchini raisin cookie (cut in half), pepper jack cheese cubes, carrot & celery sticks, blackberries & strawberries. Packed in a Paperchase box. No extra prep. Simple Bento 4 - Turkey & cheese sandwich on multigrain sandwich rounds, cut in quarters, marble cheese stars. 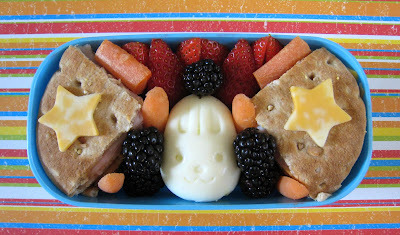 Boiled egg shaped like a bunny (this is a mold, could just use a plain egg), blackberries, strawberries, carrots. Extra prep time 2-3 minutes for stars and bunny egg. Packed in top half of a Clickity Click box. Simple Bento 5 - Preschool snack! 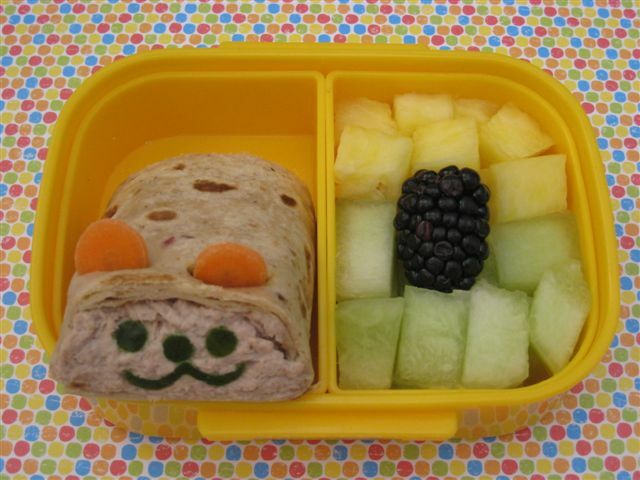 Tuna salad on multi-grain wrap, decorated with carrot ears & cucumber features, honeydew, pineapple, blackberry. Extra prep time 5 minutes. Ears are baby carrot rounds, wrap was sliced so they could slip into place. Eyes/nose are cucumber peel cut with a straw, mouth is cucumber peel cut twice with top of a heart shaped cookie cutter, features just "stuck" to the tuna salad. Packed in a Disney Store snack box. So cute! 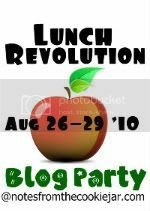 For more, go check out her blog over at What's For Lunch at Our House.